Written by popular author and .NET expert Jesse Liberty, this thoroughly updated tutorial for beginning to intermediate programmers covers the latest release of Microsoft's popular C# language (C# 3.0) and the newest .NET platform for developing Windows and web applications. Our bestselling Programming C# 3.0, now in its fifth edition, is a world-class tutorial that goes well beyond the documentation otherwise available. Liberty doesn't just teach C#; he tells the complete story of the C# language and how it integrates with all of .NET programming, so that you can get started creating professional quality web and Windows applications. 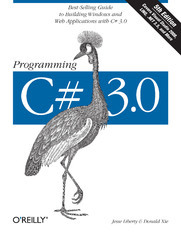 This new edition of Programming C# 3.0 is for working programmers who want to develop proficiency in Microsoft's most important language. No prior .NET experience is required for you to get started. There's no time like the present to work with C# -- and no book like this one to teach you everything you need to know. Special note to VB6 and Java programmers: if you've decided to transition to .NET, this book will take you there. 2. Getting Started: "Hello World"
Compiling and Running "Hello World"